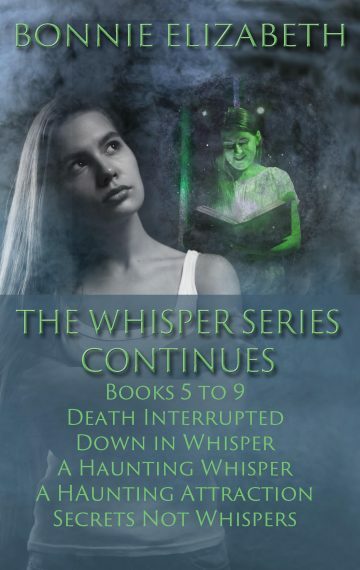 The Whisper Series books 5-9, Death Interrupted, Down In Whisper, A Haunting Whisper, A Haunting Attraction, and Secrets Not Whispers. Death Interrupted: Even vampires find Whisper a dangerous playground. Nearly killed in a hit and run accident, Rain McFarland lives only because of Peter’s quick actions. But death continues to stalk Rain in the form of a vampire. The hit and run driver holds the clue that Meg needs to find out why someone would try and kill Rain. Meanwhile, vampires stalk prey where they find it with a hunger that won’t be assuaged by one victim alone. Meg’s investigations thrust her in harm’s way, along with Rain, once again. Peter, Whisper’s charismatic and capricious earth spirit, remains vigilant against the creature. But if the vampire forces him to choose between Meg and Rain, which woman will Peter save first? A plane crashes in the night. A pilot is dead. People disappear. Each new mystery brings more questions to Barringer and Associates. Peter depends upon Meg and Rain to find the answers. Meg decides she must be the one to find them. It might be difficult, as the playing field doesn’t seem level. Meg’s coworkers are checking in with Rain and everyone, even Meg’s father, seems determined to keep her from seeing the plane wreckage. Frustrated, Meg keeps working harder, turning up contradictory information. If she can’t get the pieces of the mystery together, who else will disappear from Whisper? And what will Meg do if it’s Peter? Down in Whisper is another exciting installment in the popular Whisper series. A Haunting Whisper: County Sheriffs pounding on the door wake Meg Barringer early one morning. They claim Peter murdered a teenaged girl. Shocked to learn that the sheriffs might be right, Meg buries herself in other work. A Haunting Attraction: Marcus flees to Whisper, begging the resident earth spirit, Peter, to help when his girlfriend, Amy, collapses. Meg can only watch as her sister suffers. Peter causes more harm than healing. Marcus takes Amy back off the mountain leaving Meg to her usual work. Sensitive to psychic influence, even Meg’s presence induces pain for her sister. Even buried in work, investigating grave robbing, fraud, and money laundering, Meg’s ties to Amy mean that a crisis of health could mean the end for both of them. Whisper lovers will adore this eighth installment of the magical fantasy world of Whisper. Secrets Not Whispers: Meg arrives amid typical Las Vegas chaos, but not all of it is normal. She thinks a local mountain has moved. Her ties to Peter severed so she can heal, Meg investigates on her own. Back in Whisper, a murderer tangles Rain in her web. Barringer and Associates works harder than they ever expected examining clues to what is happening to Rain and to Meg. Secrets Not Whispers is the ninth exciting installment of the Whisper series, wrapping up the plot that began in A Haunting Whisper. Don’t miss it.